North Carolina State University students wait in line to vote in the primaries at Pullen Community Center in Raleigh, N.C., on March 15, 2016. In a major victory for voting rights, a federal appeals court struck down North Carolina's stringent requirement that voters show identification before casting ballots, and also reinstated an additional week of early voting, the Washington Post reports. A three-judge panel of the U.S. Court of Appeals for the 4th Circuit came to the decision Friday, vindicating civil rights groups and the Justice Department, all of whom argued that the particularly strict voter-ID law was designed to keep black voters from exercising their civil rights after record turnouts in 2008 and 2012. “We can only conclude that the North Carolina General Assembly enacted the challenged provisions of the law with discriminatory intent,” Judge Diana Gribbon Motz wrote for the panel, according to the Post. In 2013 the Supreme Court of the United States gutted the Voting Rights Act, removing the requirement that certain states with a history of discrimination be "precleared" before changing voting laws and procedures. 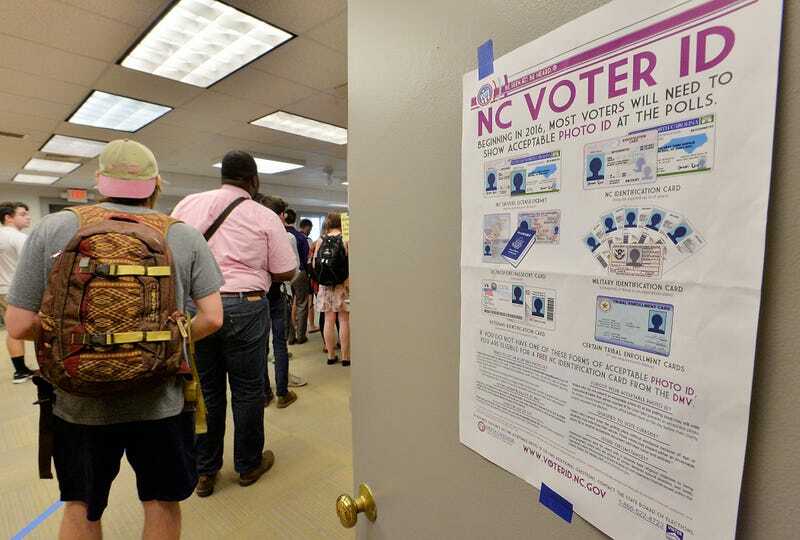 Shortly thereafter, North Carolina lawmakers did a complete overhaul of the state's election law, eliminating same-day voter registration, rolling back a week of early voting and completely stopping out-of-precinct voting, the Post notes. According to the Post, during oral arguments, Judges James A. Wynn Jr. and Henry F. Floyd commented on the timing of the sweeping changes and on comments made by a state senator who quipped that legislators were no longer held back by the "legal headache" of the Voting Rights Act. Justice Department attorney Anna Baldwin told the court that thousands of voters were "shut out of the political process" in 2014 because of the abrupt and strict changes to the election law. Approximately 1,600 ballots that were cast in the wrong precincts were not counted. Some 12,000 people were not able to register to vote the same day as the election. The North Carolina State Conference of the NAACP responded to the ruling Friday afternoon. "The circuit court’s ruling today is a people’s victory and a victory that sends a message to the nation,” said the Rev. William J. Barber II, president of the North Carolina State Conference of the NAACP. “The court found—under the sensitive inquiry required by law—that how the law was enacted and its impact made crystal clear that discriminatory intent impermissibly motivated this General Assembly. Under our Constitution, and under the core principles and dictates of the Voting Rights Act, these provisions have no legitimacy under the law.